The PodCastle engines are low on fuel, so we’re coming in for a landing next month to fill up on fiction! Our submissions portal will open again on November 1 and will remain open for the entire month. Please take a look at our guidelines then visit our submissions portal to submit. We accept original and previously-published fantasy fiction under 6,000 words. Grab your tickets and hop on board during our brief touchdown! We’re looking forward to reading your work. ARTEMIS RISING Is Open for Submissions! September is here, and we are open for submissions for ARTEMIS RISING, our fourth annual month-long event across the Escape Artists podcasts featuring stories by women and nonbinary authors in genre fiction. I know tough older women. Firefighters for the national forestry service. Mechanics. Veterans. Founders of engineering departments. I’ve been honored and humbled to call them sisters, mentors, and guides. They are weather-beaten and grizzled, and no less women for it. The live, love, and crack jokes. Some have families; some don’t. But there’s a perception that these women aren’t women because of their vocations, and those vocations have been the province of heroic male characters in fantasy for as long as I can remember. If you want to explore archetypes, go deeper. “Strong female character” is as much a box as “hero’s girlfriend.” Show me complexity, experience, insight. Take maiden-mother-crone and shift it into youth-warrior-sage. I want warriors and sages in spirit, even if they never pick up a weapon. I want female heroes, non-binary heroes—and most of all, I want a damn good story. If your best doesn’t quite match the above, but still fits the spirit of Artemis Rising, send it. Write what feels true… but for PodCastle’s slice of Artemis Rising this year, that’s what feels true to me. Head on over to our submittable portal to submit now. 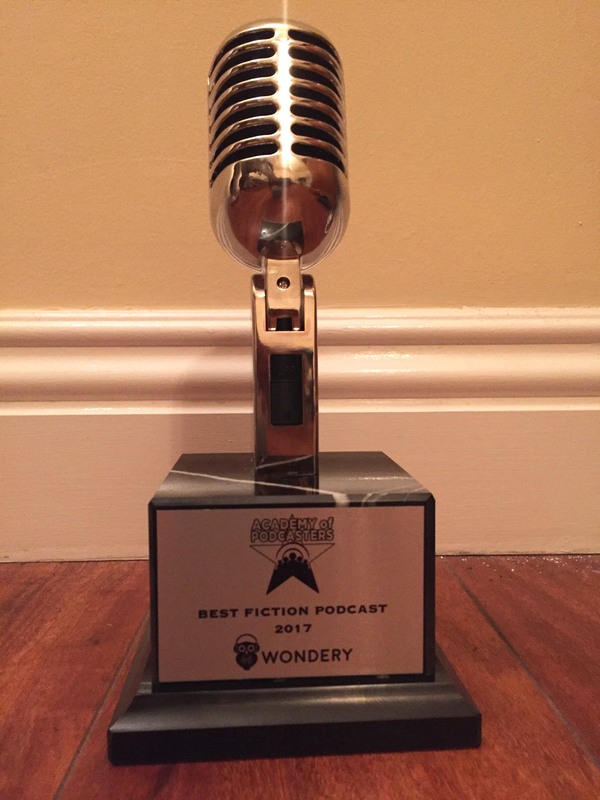 PodCastle Has Won Best Fictional Podcast! We’re very excited to announce that PodCastle was nominated for and has won the award for Best Podcast—Fictional at the Academy of Podcasters awards this past week! We were shocked and delighted to have won. We’d like to congratulate our fellow nominees: Alice Isn’t Dead, Hello from the Magic Tavern, Homecoming, LifeAfter, Terms, The Black Tapes, The Bright Sessions, Welcome to Night Vale, and Within the Wires. We’re so honored to have been recognized alongside these wonderful, groundbreaking podcasts. A huge thanks goes out to everyone who’s helped get the castle off the ground—to our current and former staff for all their dedicated work, to our talented authors, narrators, and other contributors, and of course, to our wonderful listeners, who’ve stuck by PodCastle all these years. Thank you! PodCastle Is Seeking A Story for Halloween! This week, PodCastle invites you to scare us! We are looking for a Halloween story for 2017. If you’re a writer with a short story (original or reprint) that you’d like us to run this Halloween, visit our submittable portal now. Scary or funny, ghosts, ghouls, or goblins—haunted stories of all kinds are welcome. The jaws of the portal snap shut at the unholiest of hours (midnight, EST) on August 19th, so be sure to feed the beast your less-than-6,000 word offering in time. Simultaneous submissions and multiple submissions will be regurgitated automatically, so please don’t send them for this call. See the portal for more terrifying submissions details.